Treasury Strategies, a division of Novantas, Inc. estimates that companies spend nearly $20 billion per year of bank treasury management services in the U.S. and more than $200 billion worldwide. Corporate treasurers who optimize their use of these services enjoy accelerated cash flow, improved risk management, higher investment income and quality information, all at a reasonable cost. In moving services from one bank to another, companies fail to complete the migration. When companies merge, many do not take the opportunity to streamline their operating bank structures. Companies with decentralized or global treasury operations purchase redundant services or duplicate information from their banks. When companies upgrade to more advanced cash management services, they fail to turn-off the legacy service. Many companies use late-life cycle bank products that are no longer efficient. In their zeal to minimize bank service fees, they do not take advantage of value-added services and just stick with the plain vanilla. Companies who demand exception processing from their banks are probably paying dearly for the service while missing the benefits of newer, state-of-the-art treasury products. Companies that spread their services across many banks are probably operating sub-scale. Companies with inefficient bank account structures are likely undisciplined at many levels. In all these cases, companies are losing value. Some companies may be overpaying for transaction banking services while others are missing scale opportunities and volume discounts. Some may require extra staff just to do the reconciliations required by an inefficient bank account structure while others purchase redundant information services from their banks “just to make sure.” Many leave excess balances on deposit at low earnings credit rates as a cushion for the errors that are certain to result from a poorly designed treasury management system. Worst of all, these poor practices expose companies to financial risks or fraud. The first step in a banking services optimization is to catalog each of the major payment categories by function. In doing this, you will get a good handle on specific service requirements. That will help in identifying best in class transaction banks for your consideration. Outbound Commercial Payments settle purchases between you and your vendors. Intracompany Transactions move funds between company accounts for either cash concentration or funding needs. Supply Chain Networks are regular and highly structured transactions with a smaller set of trusted vendors requiring extensive data interchange, dynamic discounting or other types of highly integrated payments. Liquidity Management Transactions settle short term investment and borrowing needs. Capital Transactions are large and irregular payments for major balance sheet items such as capital goods, real estate, capital markets activities and M&A. Each functional dimension entails a different set service features that need to be paired with your banks’ specialties. This list should make clear that for most companies, this is not one size fits all. The treasury information services required for intracompany cash mobilization transactions are very different than those required for inbound commercial payments. The former simply requires info that the transfer has been completed while the latter requires extensive detail for receivables cash application. Finality of settlement criteria for capital transactions are much higher than for repetitive vendor payments. Risk management and fraud prevention services are more critical for higher value, lower frequency outbound activities. After thoroughly documenting your requirements, you can begin to identify the banks best suited for each activity. This is usually done within the constraints of your credit banking structure, geography or other organizational imperatives. Some companies prefer to conduct extensive requests for proposals and bank fee negotiations. Others are quite successful with informal bank presentations and discussions. Both methods can work. The key, in addition to being systematic and methodical, is being equipped with good information. That means utilizing NDepth bank fee management benchmarks in either approach. Make sure you receive monthly account analysis statements from each of your transaction banks in an electronic format. We recommend either true PDFs, EDI 822s or TWIST BSB files. New technology is available to help corporate treasury managers read PDFs and avoid the more IT intensive EDI or TWIST files. Manage your bank services at a product family level. Banks use well over one thousand service codes in their product structure and their account analysis service billing. Not only is it impossible to manage at that level of detail, it makes no sense. Many of those codes are just features or components of the complete product which cannot be unbundled. All those components need to be managed as a package, a product family. Benchmark your bank fee pricing and earnings credit rates. You want to make sure you’re paying a fair price for services that are critical to your business. Some benchmark services simply ascribe an “average price” for each service line item. That completely misses the point. 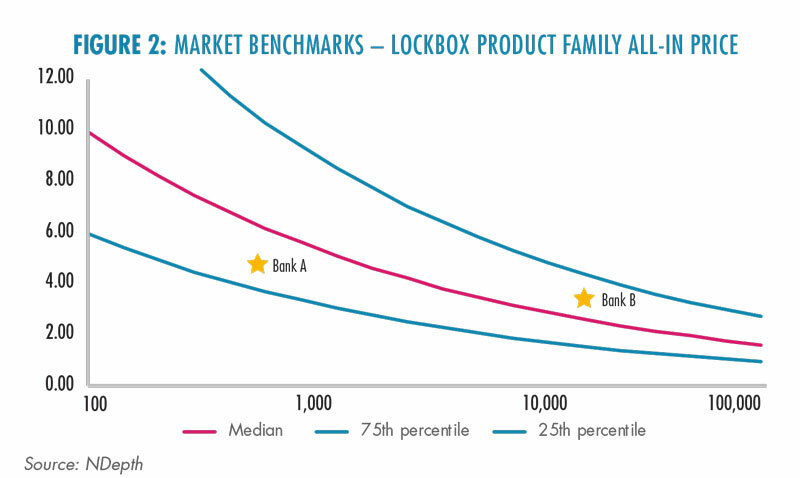 Benchmarking needs to occur at the product family level and to incorporate volume scale. A fair price for a low volume of a service is higher than for a higher volume of the same service.Just consider the chart that illustrates the scale dynamics of lockbox services (Figure 2). The $5.00/item this company pays for a low volume lockbox at Bank A is below the market benchmark. However, the $4.00/item it pays for a higher volume lockbox at Bank B is above the benchmark median. Without proper benchmarks (or with self-benchmarking), a treasury manager would reach a differ and incorrect conclusion. Use tools to monitor your monthly bank account analysis statements. Many bank services billing statements run dozens of pages with hundreds of line items. Several banks display AFP Service Codes in an attempt to standardize, yet they are often inconsistently applied. The sheer volume of data defies rekeying into spreadsheets. Fortunately, advanced tools like NDepth can easily read your AA statements, validate and ingest your data, map into product families and benchmark against the market. Keep a watchful eye on your information service charges. Information services is perhaps the trickiest product family to manage. Bank and AFP service codes do not fully capture the wide array of information services. Some are priced by module, others have monthly maintenance charges or daily transmission charges. Some are based on file size, others keystrokes. Further complicating matters is the proliferation of information delivery channels such as web portals, EDI, file transmissions, phone updates, email and text delivery, mail and courier. The best practice is to understand these services, ensure you pay for each piece of information only once, and use the channel most effective for your business. Be mindful of services with high fixed costs. Monthly maintenance fees, subscriptions, daily charges and fixed module charges are assessed whether you have one transaction in the product family or tens of thousands. We advise our clients to regularly examine these types of services and consolidate volume whenever it makes business sense. Notice the median (red) line in the lockbox chart (Figure 2). This is a great illustration of how volume scales. In fact, using extensive NDepth data, we have been able to calculate that lockbox product family pricing declines by 24% for every doubling of volume. That’s compelling. 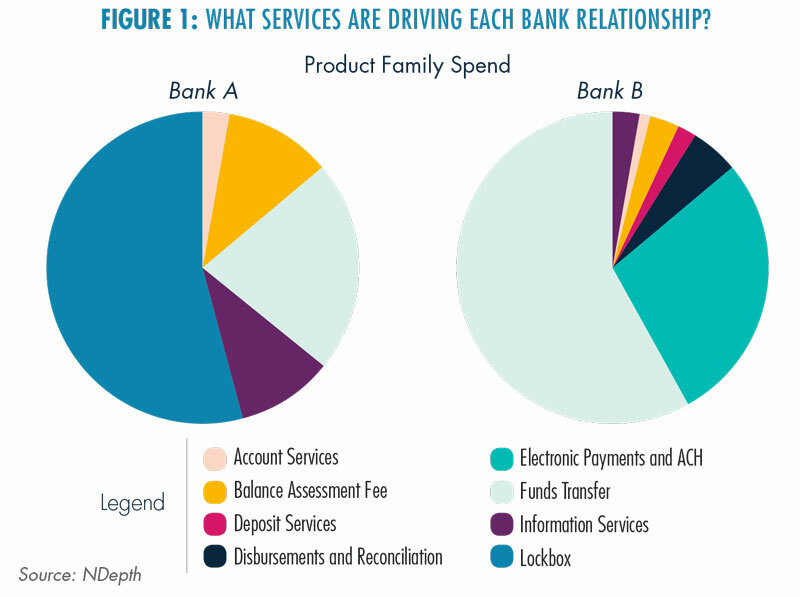 All transaction banking services exhibit these scale pricing dynamics at a product family level, at varying rates. Avoid penalty fees. Banks charge for bad behavior so make sure you’re buttoned up. Avoid overdrafts. Make sure your funds transfer formats and your ACH files comply with Fedwire, SWIFT and ACH standards. Evaluate carefully before asking for exception processing. Use electronic rather than paper-based services. Corporate Treasury Priorities — Each year, Treasury Strategies assesses the state of the treasury profession and key issues on the horizon. Top priority for this year is cash forecasting, treasury systems and optimizing treasury technology. Top benchmarking need is bank service fees. Making the Most of Your Bank Balances — Many corporate liquidity management programs overlook bank balances. This article explains the importance of ECR, compensating balances, bank sweep accounts and money market funds.